In high school and college I was the biggest procrastinator! I’d always wait ’til the last minute for everything. Doing an essay could always wait til the night before and waking up in the morning looked like a replay of snooze in the alarm clock. Having children changed that significantly because there is no way a 2 month old waits! Young children want their food NOW! They want to be carried NOW! They want a diaper change NOW! All my needs had to wait until later and the old adage of “why do today what can wait until tomorrow” simply did not work for me anymore. Needless to say, I learned to take action quickly and pronto. My days of procrastination were over! Today, I recognize that at its simplest form, procrastination is a mind game that tricks us into believing we have more time than we actually do (we think we have hours when we only have minutes, we think we have years when we only have days, we think we have a lifetime, when we don’t, etc..) The harm in that is we don’t measure time properly and eventually we don’t meet our goals and the cycle of self disappointment starts. You wouldn’t believe it… IT WORKED!!! He told me he was taking action on everything, because he imagined the burning building. If you want to know exactly how the “Burning Building” strategy works (that’s for men- I have a strategy for women too), make sure to watch the video below. 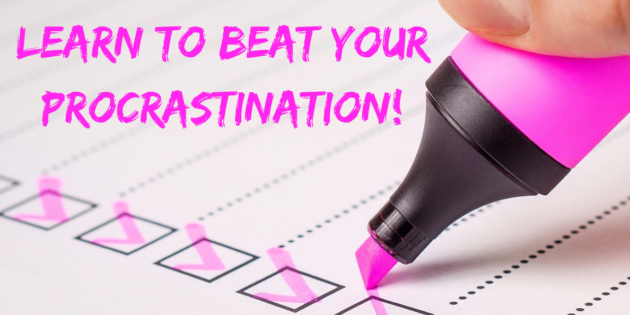 Question- Are you a procrastinator or know someone who procrastinates? What are the effects of procrastination?